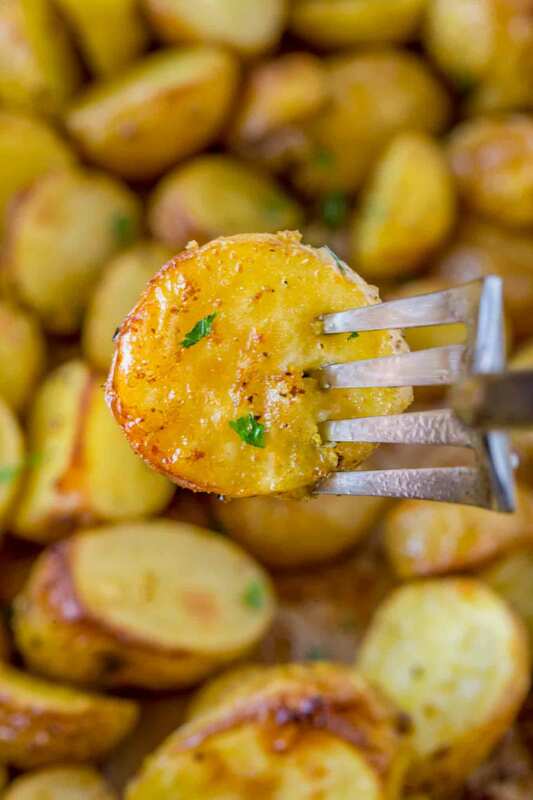 Rotisserie Chicken Roasted Potatoes made crispy in the oven coated with chicken base and olive oil, these healthy potatoes taste just like all the best parts of the crispy skin of your favorite rotisserie chicken! Rotisserie Chicken Roasted Potatoes may sound a little confusing. Like is there chicken baked with potatoes somehow? No, it’s roasted potatoes that have been tossed with salt, pepper, oil and….. chicken base! The flavors of chicken base, or Better than Bouillon which is the version I use is a slightly salty ultra concentrated chicken flavor. It’s made of broth/stock that has been cooked down to reduce the liquid content until its just a paste. Well… I miss rotisserie chicken skin (I hope that doesn’t make me sound like a creepy person) so I have been trying to come up with ways I could have that flavor in my life. One day while working on multiple recipes I was about to roast these potatoes off as a prop (just to have them in the background of another recipe) and the tray was sitting next to the chicken base. So I figured what harm could it do, no one was going to need the potatoes for a post or anything. I tossed them with a couple tablespoons of the base and roasted them off. YES. It was SO GOOD. My husband ended up standing over the tray eating them while they were still hot. 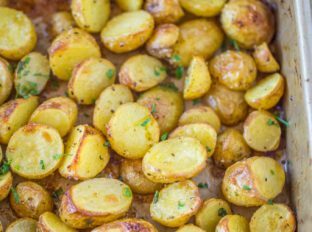 I find Yukon gold potatoes and red bliss potatoes to be the best for roasting because of the thin skin and creamy potato texture. They don’t require as much oil as russet and sweet potatoes do and they brown well. Using baby potatoes also helps to brown them with a small amount of oil as the skin crisps up very easily. Add the potatoes to a large colander set into a bowl of water bigger than the colander. Then using a silicone sponge (keep one for vegetables), scrub the dirt lightly off the potatoes one by one, similar to mushrooms but in water. The flavors in this Rotisserie Chicken Roasted Potatoes are like that delicious rotisserie chicken skin that leave the little specks on your fingers, but with a buttery yukon gold potato to go along with it. This may not be a normal recipe for something you’ve heard of, but if you have some better than bouillon in your cupboard give it a try. PS I tried this with other flavors of the base too, and I can’t really vouch for any of the other flavors. The beef was almost something I would want more of, but not quite. But the chicken flavor was AWESOME. 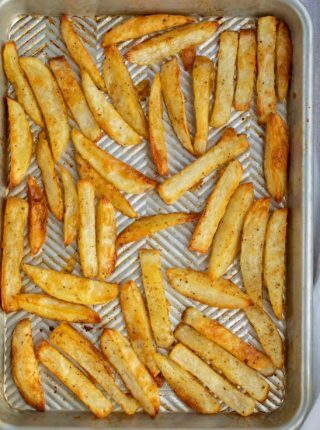 Sheet Pan: Inexpensive but high quality, won’t warp in the oven. I own 8 of these sheet pans for volume cooking for clients. Rotisserie Chicken Roasted Potatoes made crispy in the oven coated with chicken base and olive oil, these potatoes taste just like all the best parts of the crispy skin of your favorite rotisserie chicken! Add the potatoes, olive oil, kosher salt and black pepper and toss well. Add in the chicken base (better than bouillon) and toss well. Add to the sheet pan and roast for 30-35 minutes. I LOVE chicken skin, so you’re not alone in that lol. 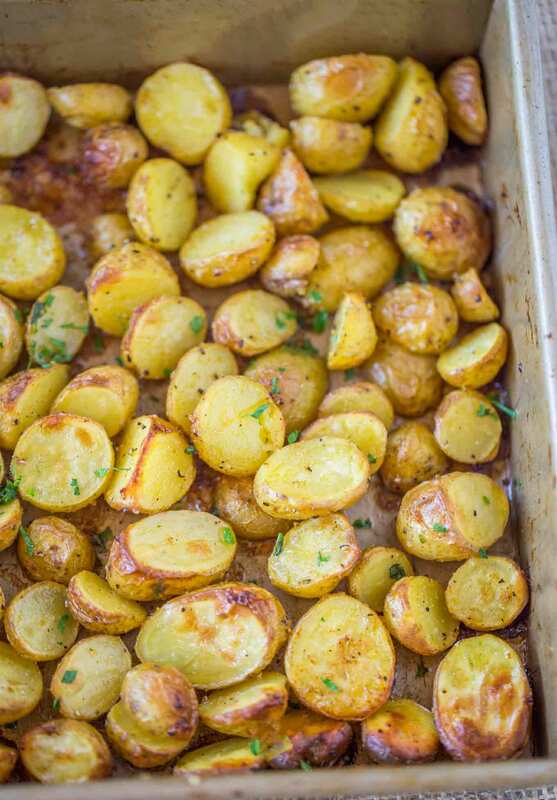 These potatoes look fantastic! This looks delicious, definitely saving this to make it in the future! I love the browning you got on these potatoes, I love the crispy outside and soft inside. I am loving these!! They look SO delicious!! Such a great recipe! Must try this! The crispy skin in MY FAVORITE part of the whole chicken! Thank you for helping me get the taste of that with spuds! Haha, I know, right?! Crispy skin is the best! 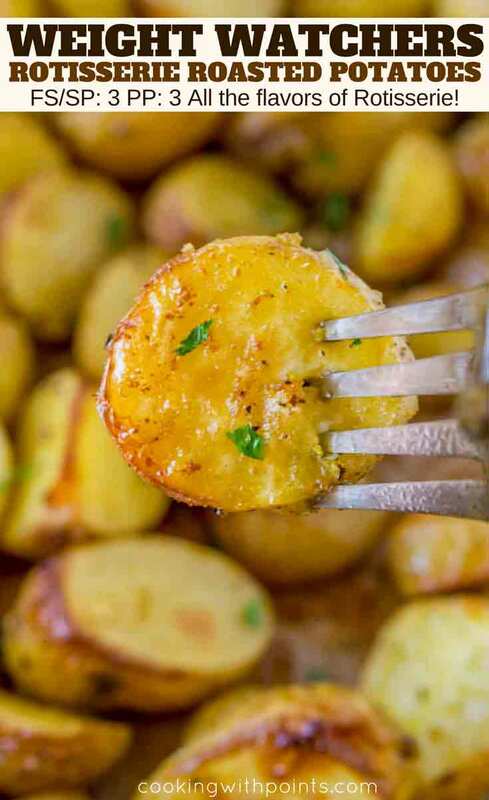 Roasted potatoes are my favorite! 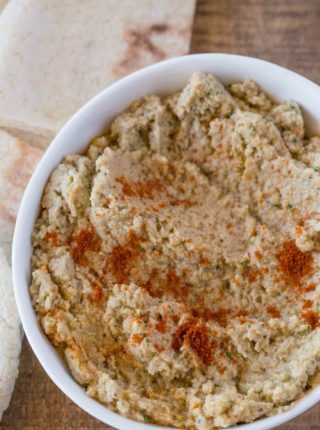 This is a perfect side dish to so many dinners! This is a great idea, thank you for the recipe. I am making these tonight! Sounds yummy! !